I have been fortunate enough to have traveled and worked with leaders in many parts of the world. Irrespective of the industry or the location – I’m still struck by the similarities that I continue to see. The universal truth is that, regardless of the leader’s organization, country, culture or expertize – the need to relate to others remains a critical success factor. Relationships and leadership, leadership and relationships; they are inextricably linked. What is trust? The Merriam- Webster Dictionary defines trust as “the assured reliance and confidence in the character, strength and integrity of someone or something”. But what does this mean in practice? Trust exists when you can be vulnerable enough to freely express you ideas and feelings without the fear of reprisal. Trust also occurs when your audio and video (actions and words) are congruent; when agreements are kept and differences are met head-on. You know it when you have it and keenly feel it when it’s not there. Trust is earned over time but can be broken in an instant. People want leaders they can look up to, hold in high regard and be proud of. Similarly, people want their leaders to believe in them and to care about them. People want to feel that they make a difference – whatever their role – and to be recognized for doing so. Several research studies have demonstrated that employees value a caring leader more highly than financial packages and fringe benefits. But mutual respect can be tricky – mutual respect means that both parties respect one another. It is possible to make another person respect you, but it’s not something that you can easily control. It is, however, something you can encourage. What constitutes mutual respect? It starts by listening. Carving out the time to understand others – their needs, wants, fears and opinions – and, critically, doing so without being focused on your own agenda. ‘Beneficial intent’ – i.e. not making assumptions or attributions about the intent of another’s action – is a key mindset here. Give people the benefit of the doubt; talk to them and explore the issues that they bring up. Mutual respect grows over time and deepens with the willingness to be honest, to listen and to invest time and effort in others. How well do you know your team-mates or colleagues? Does your knowledge go further than simply being aware of their work experience and expertise? Deep understanding goes beyond the surface data points of ‘name, rank and serial number’. It exists when you have insight into a person’s make-up, key drivers and goals. It comes with an appreciation of who that person is and an understanding of their unique journey. Finally, deep understanding is cemented through an acceptance of others and their feelings. John Gottman, Ph.D., an expert on relationships, discovered that the way in which people pay attention to one another is critical when it comes to developing good relationships. He calls these connections “bids” and “responses to bids”. “Bids” are conveyed in a myriad of ways; some are easy to discern, others less so. They can be questions, statements, comments or non-verbal gestures. Gottman’s research identified three responses to bids. The first one occurs when you turn toward the other person and they reciprocate; this in turn encourages further connection and a deepening of the relationship over time. The other two bids occur when one turns away from, or against, the other person – and in so doing, breaking the emotional connection of the relationship. Over time and repeated often, these latter bids are likely to destroy the relationship. Good leaders learn how to build good relationships. They know the value that a sense of belonging brings to their team and organization – even though it requires a sustained investment of time. Effective leaders are prepared to invest the time and effort that it takes to develop relationships because they recognize the very strong business imperative for doing so. How good are your relationships? 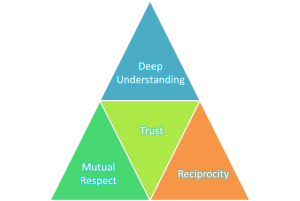 A valuable starting point is to take time out to reflect on the relationships that you have with your key stakeholders and to consider them through the lens of trust, mutual respect, deep understanding and reciprocity.